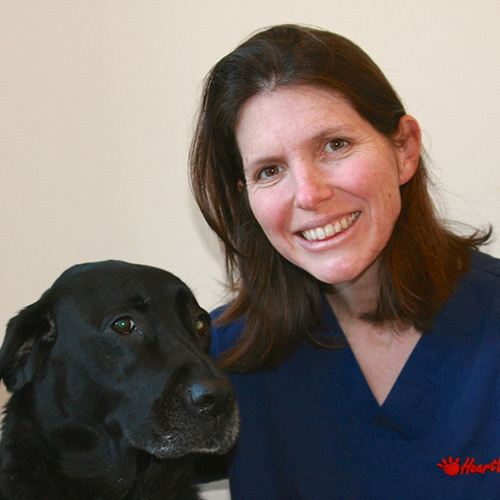 Jo Harris from HeartVets regularly visits our practice, providing expert cardiology care to our patients. Jo runs referral clinics at our Plympton surgery each month, where she sees pets that have been referred to her from veterinary surgeons all around the South West, as well as our own. Jo is now an RCVS Recognised Specialist, meaning she has achieved the highest level of training and expertise in her area of veterinary medicine. Together with the other members of the HeartVets team (fellow Specialists Mark Patteson and Dave Dickson, and cardiology clinician Bill Slee), Jo sees patients across the South West UK, as well as running their online diagnostics service providing ECG/radiograph interpretation and Holter monitor rental and analysis. Jo has published articles in top-tier academic journals and continues to be actively involved in various cardiac research projects. She teaches cardiology to local vets and is a regular speaker at national and international conferences.